Makeup And Fashion Freak: Streetwear Color Rich Range ~Best Budget Buys Ever!! Streetwear Color Rich Range ~Best Budget Buys Ever!! Streetwear, a budget brand by Revlon, had launched some makeup products sometime back with quirky packaging and a wide range of colors to choose from. Perfection Compact powder ~ ₹170 available in 2 shades. I heard its pretty nice and smooth. Perfection Foundation ~ ₹170, available in 2 shades. Rich Nail Enamel ~ ₹60, available in 30 shades. Liquid Liner ~ ₹75, available in 2 shades - Egyptian blue and coal black. Megashine Lipgloss ~ ₹150, available in 8 shades. Ultramoist Lipstick ~ ₹180, available in 24 shades. I picked up 2 lipsticks,1 nail paint and a kajal. Will post about the lipsticks in a separate post but here's what I have to say about the Kajal and the Nail Paint. Streetwear Color Rich Kajal looks like the old kajal we used to get. in the market, similar texture and pigmentation with a quirky print . It comes with a sharpener. Even with several swipes it does not go black and is not matte like other kajals I use. Also it's not smudge-free or waterproof. I think you should give this one a skip. 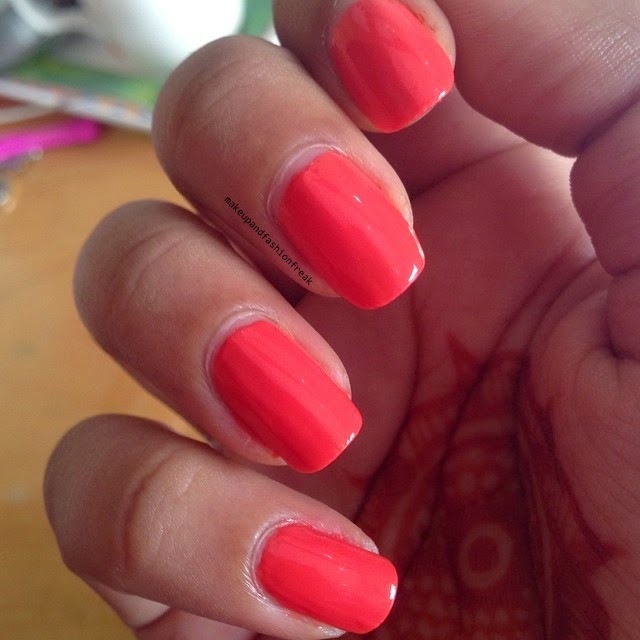 Streetwear Color Rich Nail Enamel in Saucy Orange is a pretty coral-orange color. It applies evenly and goes opaque in two coats. I find the packaging cute and the quality is also good. With such an affordable price tag, you get to choose from a wide range of colors and I am definitely buying a couple more of them.